I had a question. 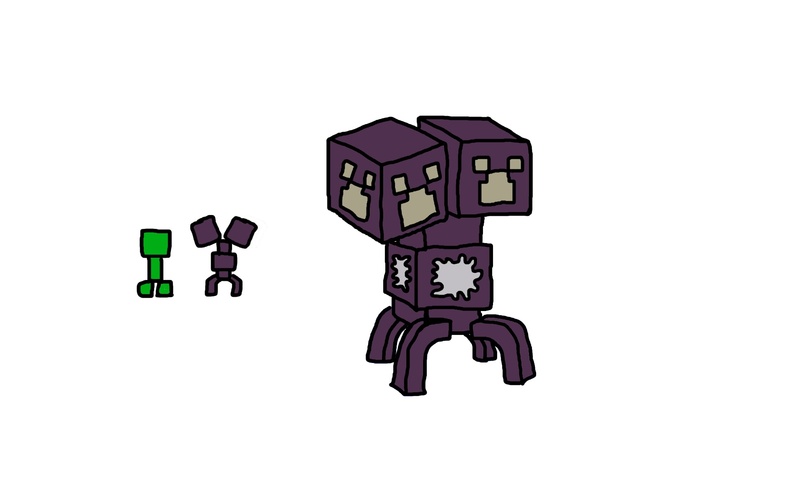 If Choran were to be spawned in the overworld via spawn egg, and then they got struck by lightning(either natural or artificial), will they become charged like a normal creeper does? Anyways, support. This would be a true challenge to the otherwise boring End Dimension. I suppose yes, though I haven't though much about it. If a Choran were spawned in the Overworld, their explosion radius would already be huge, because their explosion would is increased to accommodate endstone hardness. I can't imagine what a charged choran would do. Well, let's be happy that the only way for Choran to be in the overworld is via spawn egg or /summon command. Otherwise, my fortress will have a GIGANTIC crater in it shall Charged Choran were to occur. Or perhaps it's explosion strength is weakened in the overworld ? Well, I would like to see some kind of super "nuke" mob, but that may sound like an overkill to me. Maybe it could actually have a model like a chorus plant and stay still whenever the player is looking at it. Like a weeping angel in a room full of statues. I don't want it to completely lose its "base on creeper" feel. I think AaronBlader's model does a good job balancing the "alien" with the "creeper". Anything further and I might as well change its behavior to make it 100% original. As for the pronunciation, I think I just realized I've been pronouncing "chorus plant" wrong for two years. If you are going with the proposed new two-headed model, you should make the white chorus-flower bit flash when it is about to explode, instead of the whole thing flashing like the normal creeper. 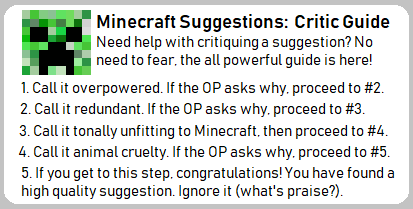 See kids, this here is proof that even the worst of ideas- the "ender creeper"- can be an amazing and interesting piece of gameplay when a smart person puts their spin on it. Very true. This: "There should be a new boss that is a black skeleton that has three heads but it doesn't have feet or arms oh and it can drop skull bombs on you." could be turned into something like the Wither. So many people have ideas that could be amazing, but they just don't think them through enough. Awesome. Full support. Love it. Although i think the e-tnt is a little weird, Because its once again connecting them with creepers. I think maybe just using a teleporter block, I personally see zero practical uses for a e-tnt. Maybe each teleporter block can be configured, and you can have a unlimited amount within the world, each one just need a specific name. 2 teleporters of the same name are "linked" and you can use them both ways. Each teleport could use a amount of the void powder.